In 2017 Hamburg recorded as many as 13.8 million overnight stays and an occupancy rate of averaging 80,3 percent – thus outperforming both Berlin and Munich. Little wonder, since Hamburg caters for virtually every taste – just think of the port, the Fischmarkt and St Pauli, the River Elbe and the Alster Lake, and of course the Elbphilharmonie, Hamburg’s new landmark. Plus, the Hanseatic City of Hamburg is also a hugely popular shopping destination. Hamburg's districts are varied and diverse, and every neighbourhood has its own story to tell. The same is true for the city’s hotels, ranging from hip and cool to modern and innovative or elegant and exclusive. Join us on our round trip through Hamburg and see for yourself! Opened but a year ago, the Elbphilharmonie Hamburg has proven to be a true magnet for visitors from near and far: in 2017, the number of overnight stays in Hamburg increased by almost four percent when compared to the preceding year. The BBC recently published a list of the world’s eight most accomplished buildings in 2017, and of course Hamburg’s new concert hall is one of them. 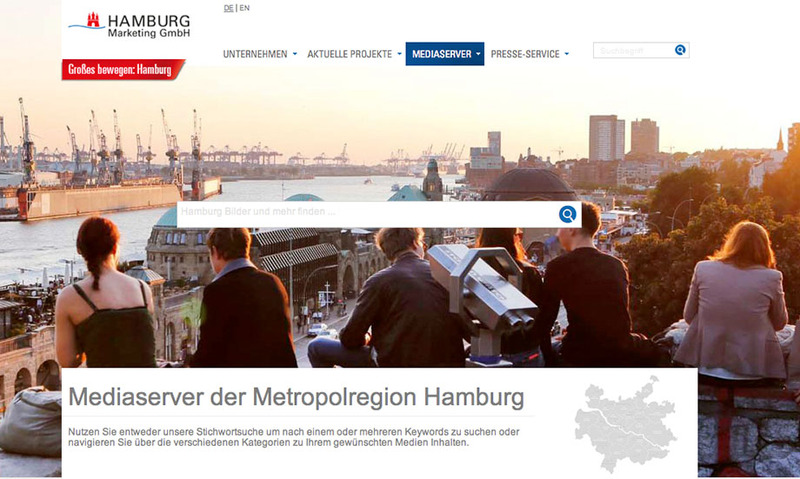 Other international media, such as Lonely Planet and the LA Times, celebrate Hamburg as one of the most exciting travel destinations worldwide. 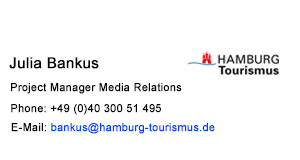 Today, Hamburg offers a highly attractive and, above all, original and innovative hotel landscape. The Elbphilharmonie Hamburg is a must-see for every visitor. Ever since its grand opening in January 2017, Hamburg's new landmark has been luring national and international guests to the city. Its sweeping architectural design and its wave-shaped glass façade with its golden glow at sunset is simply stunning. The “Elphi”, as Hamburg’s locals have come to call it, towers at the eastern tip of the HafenCity district and is thus in close proximity to a wealth of other sights – among them the Speicherstadt, the world's largest continuous warehouse complex with the nearby Kontorhaus district and the famous Chilehaus, which was included in the UNESCO World Heritage list in 2015. Other points of interest include the Miniatur Wunderland, the world’s largest model railway, as well as the International Maritime Museum, which is situated in a listed Kaispeicher building. When it comes to accommodation, you can literally stay onsite the Elbphilharmonie: The Westin Hamburg, a luxury hotel with 244 rooms and suites extending from the 7th floor to the 20th floor at the very top of the building, opened its gates in November 2016. Thanks to its floor-to-ceiling windows, hotel guests can enjoy a fabulous view of the city. Alternatively, you might want to try out the 25hours design hotel, which operates two venues in the HafenCity, and whose co-founder Christoph Hoffmann has been voted Hotelier of the Year in 2017. In the historic Speicherstadt warehouse district, the 4-star lifestyle and design hotel AMERON offers 192 rooms and suites designed in the style of the 1950s and 1960s. In the old town the 5-star hotel Sir Nikolai opened in 2017. Directly located on the historic Nikolaifleet the boutique hotel attracts guests with a clever design concept by FG Stijl, a design studio based in Amsterdam. There are more than 300 hotels in Hamburg, and the majority of these are visited by non-locals only and are largely unknown to Hamburg’s residents. And yet it doesn’t have to be that way, which has been demonstrated by a number of cities around the world, where well-managed hotels perceive themselves as a joint habitat of locals and guests to the city. This is exactly what PIERDREI intends to be: a living room for Hamburg residents and a guest room for visitors. The perfect home, where people from near and far, young and old, get together in the heart of the HafenCity district – a quarter of town that is still foreign to many of Hamburg’s locals but has long been one of the city's most important attractions. The 3-star superior design hotel aims to include a venue for concerts, theatre productions and book readings, as well as creative spaces for the little guests. There is certainly no shortage of creativity here, as the stakeholders involved comprise innovative minds such as hotelier Kai Hollmann, Prof. Norbert Aust from the Schmidt’s Tivoli Theater, as well as Sebastian Drechsler and the brothers Frederik and Gerrit Braun from Miniatur Wunderland. The interior design is sure to include creative gimmicks and surprising detail inspired by original ideas. Accommodating city travellers and families alike, the new child-friendly JUFA Hotel opened its gates in spring 2018. Located in the heart of the HafenCity Hamburg district, this hotel offers special family packages, buggy rental, indoor play areas as well as excellent outdoor facilities for children. Rooms are equipped with amenities such as baby cots, additional couches, and connecting doors between rooms. The JUFA also offers pram rental and a bike base, enabling guests to enjoy a pleasant stay while also exploring the city in the most convenient way. From the old town it is only a stone’s throw to the city centre with its many shopping opportunities, cinemas, theatres, and colourful food scene. The city centre boasts a broad range of hotels and includes e.g. the elegant Fairmont Hotel Vier Jahreszeiten, the eminent Atlantic Kempinski, the design hotel SIDE as well as countless other big names, such as the Grand Elysée, the Park Hyatt Hamburg, the Steigenberger, as well as the Reichshof Hotel Hamburg Curio Collection by Hilton, which underwent comprehensive renovations. 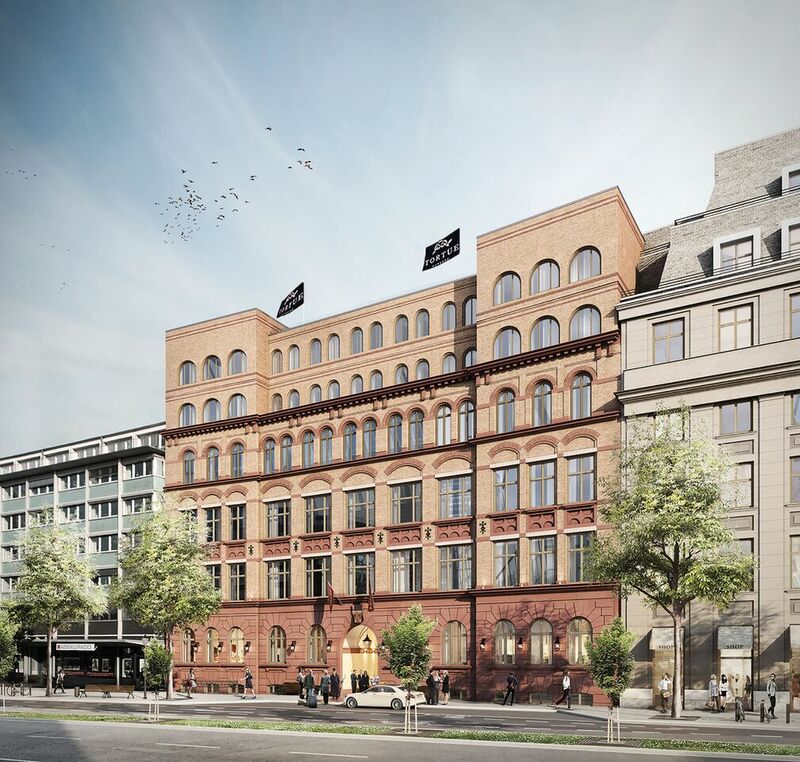 Yet another 5-star superior hotel is due to be opened in 2018 at a prominent site in the city centre and close to the ring line of Hamburg’s underground system. “Revenue office gone luxury resort” – this could be an apt headline for the opening of the Frasers Suites Hamburg. After all, the hotel’s 147 classy suites have been created in a building that used to house Hamburg’s main revenue office. This protected neo-Baroque building dates back to 1907 and exudes a sublime charm. Inside the building, the 1920s come alive again as the interior design is inspired by the era of Coco Chanel, The Great Gatsby, and Charlie Chaplin. This June will see the opening of the TORTUE (French for turtle), adding a touch of savoir-vivre from the days of Napoleon Bonaparte. With 126 rooms and a floor space of 8,500m2, this hotel project, realised within a historic building at Stadthausbrücke, is tailored to the needs of international guests – who are invited to immerse themselves in the world of TORTUE, a world that celebrates time. Hotel director Anne-Marie Bauer explains: “time to focus the mind on what is really important, to enjoy the small things and to discover new perspectives on life – time to rest and reflect.” The interior was designed by e.g. Kate Hume, Joyce Wand and Stephen William Associates as well as David Chipperfield Architects. The minds behind this hotel project promise an unparalleled synthesis of culinary delights, hospitality, events, and nightlife. In October 2017, the 4-star business and conference hotel Holiday Inn opened in City Nord’s tallest building. In May 2018, the twelve-storey apartment building “my4walls” has been launched diagonally across the street. The 143 serviced apartments vary between 25 and 32m2 in size, and the furnishing is aimed at combining design and functionality – with open kitchens, floor-level showers, furniture in 1960s retro style and smart control for lighting and music systems. 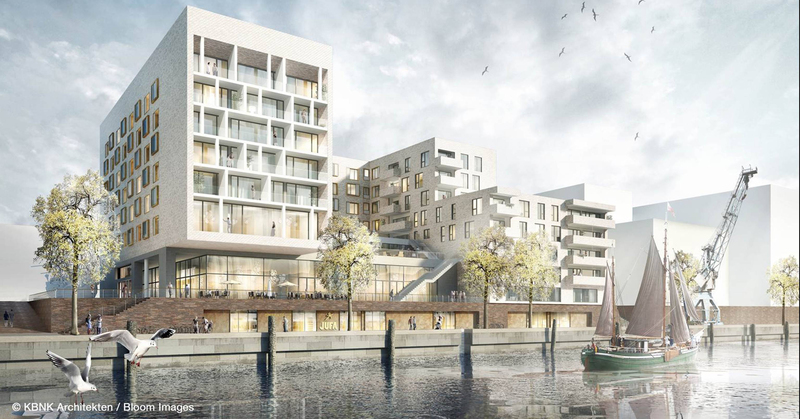 With the nearby Holiday Inn, this new building project may trigger synergies such as a shared shuttle service to Hamburg Airport. What is more, the Holiday Inn’s restaurant and spa facilities will also be open to guests of “my4walls”. 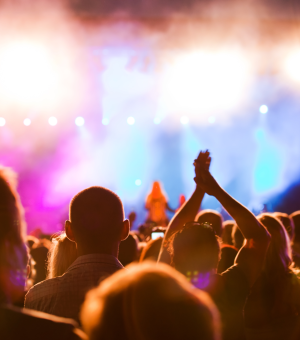 Guests who prefer to stay in hotels that are a little less upmarket and elegant should head for famous St Pauli with its Reeperbahn – the city’s first and foremost nightlife and entertainment district. 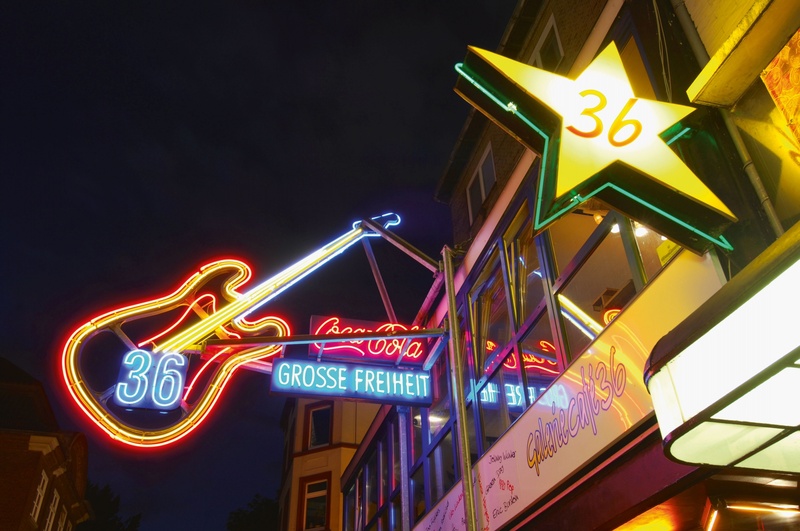 St Pauli is home to countless theatre stages, clubs, restaurants, pubs and bars, including table dance bars. Here you can turn night into day and, after a short breakfast stop, hit the retail shops in the side streets of the Reeperbahn. Various original, creative small boutiques, designer shops and vintage stores are waiting to be explored. Little wonder then that St Pauli also features a number of highly original hotel venues. Take, for instance, the ARCOTEL Onyx: its sharp contours and shimmering black façade make it a real eye-catcher. It is situated right on the Reeperbahn, just beside the “Dancing Towers” designed by star architect Hadi Teherani, who also created the twin towers in Dubai, the Living Bridge in Abu Dhabi, and the Loop office building in Copenhagen. According to Mr Teherani, the “Dancing Towers” symbolise a couple dancing Tango. And yet another star architect has set himself a monument in the St Pauli neighbourhood: Jordan Mozer from Chicago, who has transformed a former iron foundry into a real gem of a design hotel: the 4-star superior design hotel east is located on Simon-von-Utrecht-Strasse in the very heart of St Pauli. A further design highlight is currently being built on Holstenstrasse, in close proximity to the Reeperbahn: Karim Rashid, US designer and “popstar of the design world”, has been in charge of designing properties of the prizeotel brand. Thus, the 257 rooms in the prizeotel Hamburg St Pauli too will display the distinctive hand of Mr Rashid, from futuristic mirrors and an organic bar design to small items such as the spoons for the breakfast buffet. The opening is scheduled for summer 2018. 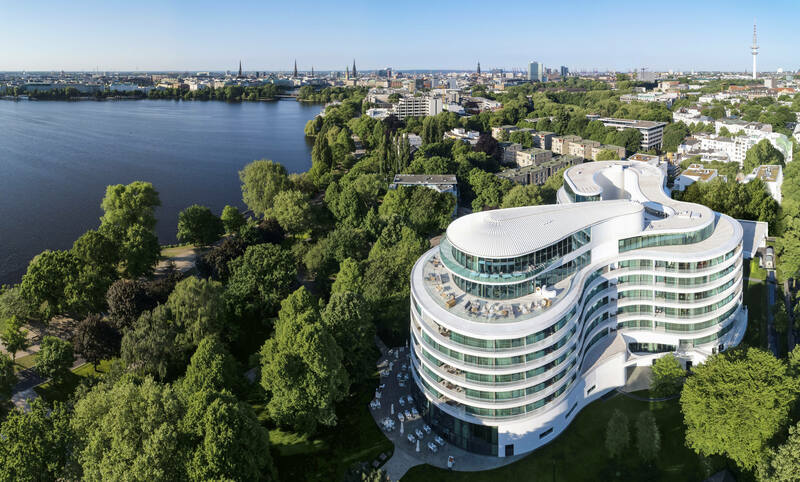 The 131 rooms and suites of this new 5-star superior hotel at a privileged location on the Alster have now been completed – on the 19th of March, Hamburg's newest luxury hotel was officially opened by contractor Klaus-Michael Kühne. Created by Hamburg star architect Jan Störmer, The Fontenay is a striking building with an almost sculptural design without any edges. The first eye-catcher awaits guests in the driveway with the elegant Himmelsspiegel well that reflects the sky, clouds and trees. It comprises 2,200 granite blocks and has a diameter of more than 13 metres. The next wow effect is likely to be the 27-metre atrium with its satinised, softly illuminated glass panels. The gourmet restaurant on the 8th floor, the adjoining terrace with a stunning view of the Alster Lake and the 1000m2 rooftop spa with a 20-metre indoor/outdoor pool certainly add to ensuring an excellent guest experience. Little wonder that The Fontenay has been included in the list of Leading Hotels of the World even prior to its opening. In the adjacent university quarter you will find pubs and cafés, as well as book shops and boutiques. 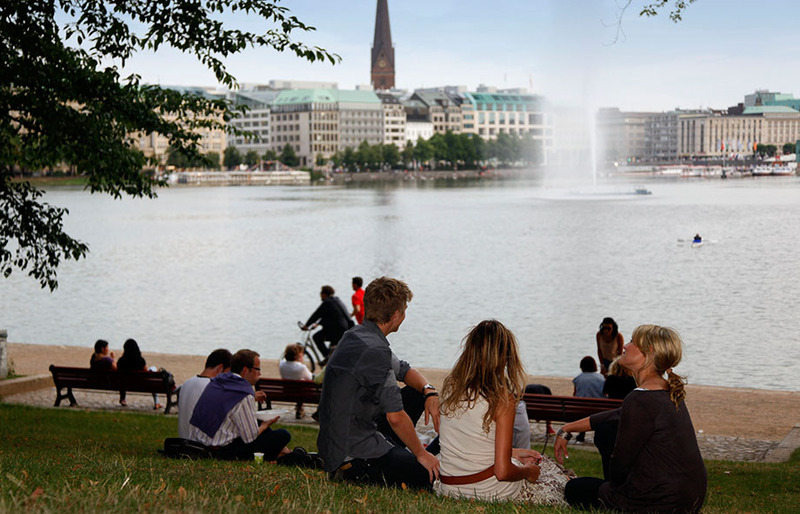 Many of Hamburg’s museums, theatres, cinemas and literary cafés are within easy walking distance. And of course there is the stroll around the Outer Alster Lake along a beautiful urban walking trail with a distance of 7.4 kilometres. The Elbe, Hamburg's other major body of water, connects the city with the North Sea and has a total length of 1094 kilometres. From the banks of the Elbe you have an unobstructed view of the passing “queens of the ocean” and can feel the relevance of Hamburg’s port: in fact, it is by far Germany’s biggest port and one of the world’s leading sea freight centres. With a view of the Elbe, you can stay e.g. in the Hotel Hafen Hamburg at the St Pauli Landungsbrücken right in the port. Alternatively, you can go almost nine kilometres down the River Elbe and reside in the traditional Louis C. Jacob. This grand hotel with its award-winning restaurant looks back on more than 225 years as a luxury hotel. It is situated on the eminent Elbchaussee in the time-honoured district of Nienstedten. All those who prefer to be closer to town should keep an eye on the GINN Hotel Hamburg Elbspeicher. 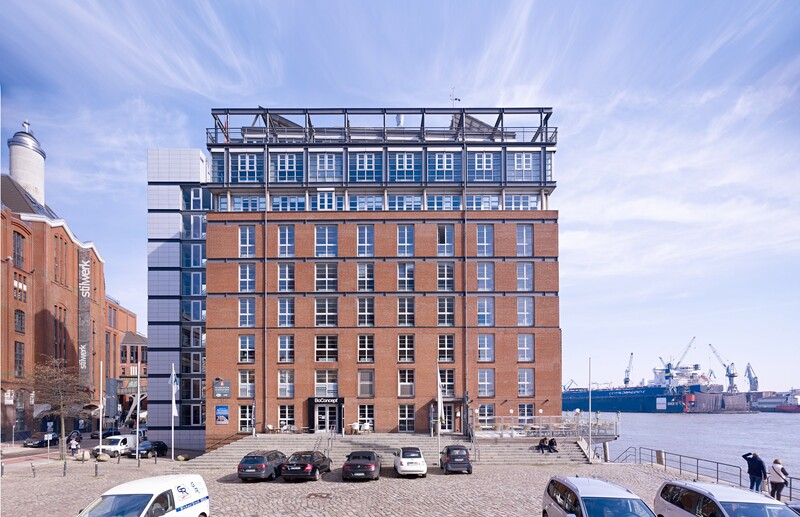 Situated directly on the River Elbe at Grosse Elbstrasse, the GINN Hotel Hamburg Elbspeicher with its 132 rooms and suites is now nearing completion. With this new 4-star design and lifestyle hotel, the GOLD INN hotel group intends to establish its new GINN brand in Hamburg. Based on an entirely new hotel concept, the rooms have an airy loft feel about them, with exposed steel beams, floor-to-ceiling windows and historic ceilings, while an RFID locking system allows guests to check in and check out 24/7, regardless of whether the hotel reception is staffed or not. This latest addition to the GOLD INN hotel group is characterised by a combination of home-style cosiness, state-of-the-art multimedia technology, and sustainability. This is reflected not only in the choice of materials used, but also in the hotel’s culinary approach that is focused on seasonal and regional produce. And, finally, let’s not forget the fantastic view of the River Elbe and Hamburg’s port.